Death was near, and he could sense it. A sixth sense was kicking in. Lincoln knew that the end of his life was creeping closer steadily but much to quickly. He was warned. The vision came first. A swinging glass was in his bedroom, revealing an image one can only imagine. The image could only be seen when he laid down in bed. It was him, only he was a sickly pale color, making him wonder if that was really him. Lincoln stood up and walked over to the swinging glass in order to get a better look at himself, only to find that the image was gone. Once more, he laid down in bed in an attempt to fall asleep, but there was no such luck. Once again he saw himself. Only this this time he was still, and much, much paler, a color that can only be described as death. The image bothered him, but he soon forgot and went on with his normal daily routine. Tears. Crowds. Body. A dead body. His body. This describes the dream he had the very day he realized his death was sadly just around the corner. The president dreamt of sobs. They seemed so close, but still so far. He couldn't find the source... until he did; a crowd around a coffin. Little did he know, it was his own. He peered over a shoulder in order to get a better look. What he found was astonishing. It was his own body. He was assassinated. Next came the real deal. No more dreams, no more reflections, just the death. The question was "Where were the bodyguards?" It was a good question, because the bodyguards were indeed nowhere to be found. According to "Assassination of Abraham Lincoln," the president's chief bodyguard, Crooks was off duty. In his place was John F. Parker, who was late to work that day. Varying sources said Lincoln allowed Parker to head off to a nearby tavern for a break. It seemed all too strange that coincidentally the very moment the president was left undefended that John Wilkes Booth stepped in. We all know what happened next. The long awaited moment seemed to go down in slow motion. The bullet was shot, "POW," the blood was out, the screams rang. It was over, or maybe not... The president was still breathing, a shaky breath, but still there. Still alive. Booth jumped from the box. But the spur of his boot got caught on the U.S. Treasury Guard Flag causing him to fall and fracture his leg. The injury did not faze him, because he still escaped through the backdoor of the theater, and fled on horseback. They took Lincoln across the street to Peterson's Boarding House where he was laid on a bed much too small for a guy like Lincoln. News quickly spread. Written reports said, Lincoln Shot. Condition Considered Hopeless. Will Not Live Through Night Doctors Declare. According to "Death of President Lincoln," members of his cabinet were at the president's side when he died." Death; 7:22 in the morning. It was time. The president was dead..... John G. Nicolay, Lincoln's secretary was by his side when he fell into his eternal rest. According to Assassination of Abraham Lincoln, John G Nicolay had something to say, "As the dawn came and the lamplight grew pale, his pulse began to fail; but his face, even then, was scarcely more haggard than those of the sorrowing me around him...." Colonel George V. Rutherford placed silver half-dollar coins on both of Lincoln's eyes right after his death. 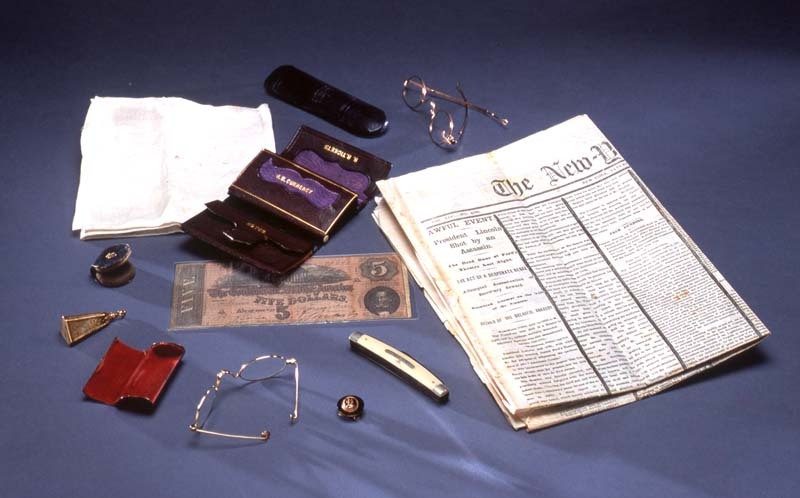 In his pockets were a few items, including his reading glasses. The death brought sorrow across the country. The deed had been done, and the last breath had been taken. Americans everywhere wept for their much loved president who was eternally put to rest. Although it was hard everyone knew it was time to say goodbye, finally, the tears stopped and the country moved on. But no one will ever forget the great things Abraham Lincoln did for America. In loving memory of our 16th President, Abraham Lincoln. "His Eternal Rest: Lincoln's Last Show " AwesomeStories.com. Jun 14, 2016. Apr 24, 2019.